Last month Samsung had launched its new set of devices. It launched the much awaited Samsung Galaxy S5 and its Gear wearable accessories. Till today the Gear devices were available for sale from Samsung’s inhouse online store. There was no real chances of earlier launch of Samsung Galaxy S5. But today Samsung Galaxy S5 has officially hit the Indian Shores. For a much longer time Samsung Galaxy S5 was available for pre-order on many Indian ecommerce stores. 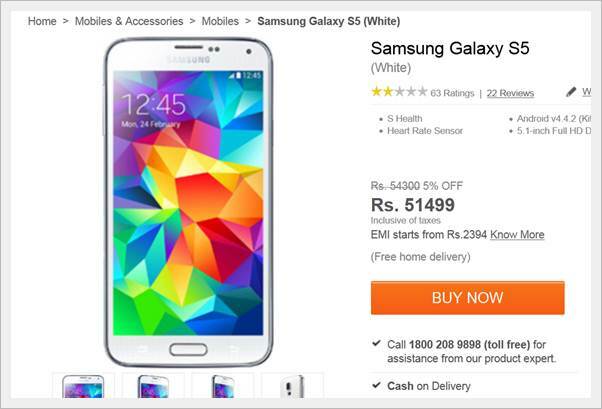 The price of Samsung Galaxy S5 ranged from ₹51,000 to ₹53,000. But now its available on major Indian Online Stores and even on Samsung’s own Online stores for ₹51,500. A plethora of offers are available for Samsung Galaxy S5 to woo buyers. Samsung in-house online store is offering 20% cashback on S5 if purchased via Citi Bank. The saddest part is; the offer is available only till 13th April. So you need to hurry to get a discount of 20%. Samsung in-house online store is even offering various EMI schemes for Samsung Galaxy S5. 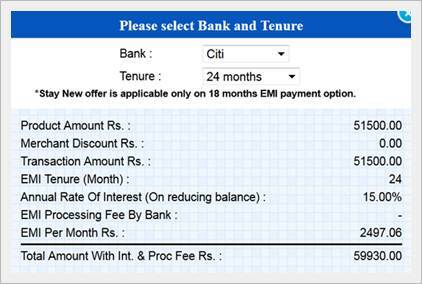 EMI options are available from 3 Months to straight upto 24 Months. Here is the breakdown of EMI from Samsung in-house online store for a period of 24 Months. You can check the entire EMI scheme for Samsung Galaxy S5 on Samsung’s online store by clicking here. Even Flipkart is offering best EMI schemes with EMI’s as low as ₹2,394 on HDFC bank. Here is the chart listed on Flipkart’s EMI scheme. In offering offers Snapdeal has gone out of the way. Snapdeal is offering 12 Months Accidental Warranty on Galaxy S5 worth ₹1,599. If bought from Snapdeal you’ll even get 3GB 3G data from Aircel. This offer can be activated via Email after 10 days from buying. You can check the latest updates from Snapdeal about Samsung Galaxy S5 by clicking here. The smartphone comes in four colors Blue, Black, White and Gold. At present no Indian online stores is providing Samsung Galaxy S5 in Gold color. Only Saholic.com is selling the phone in all four colors. You can check the full details about Samsung Galaxy S5 for Saholic.com by clicking here. The S5 features two Quad Core Processors. The processor is developed by Samsung. It features the Samsung Exynos 5422 Octa-Core processor. Basically Two Quad Core Processors are beating inside Exynos 5422. This includes a 1.9GHz A15 processor along with 1.3GHz A7 processor with Heterogeneous Multi-Processing. Unlike the Samsung Galaxy S4, this processor can run all eight cores at the same time. One thing to notice here is; Samsung Galaxy S5 comes in two models. One with Samsung’s Exynos 5422 processor whereas the other includes 2.5GHz Quad Core Qualcomm MSM8974AC Snapdragon 801 processor. The one with Samsung’s Octa Core processor is the one launched in India. Samsung Galaxy S5 features 2GB RAM. It even features two options in internal memory. One model comes with 16GB internal memory whereas the other option is 32GB internal memory. The Samsung Galaxy S5 features expandable memory of a whopping 128GB. 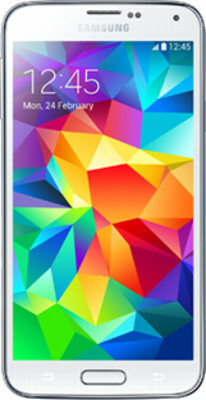 Unlike the Samsung Galaxy S4; the S5 features a slightly bigger 5.1 inch display. The display has a resolution of 1920 X 1080 with pixel density of 432ppi. Samsung Galaxy S5 has a Super AMOLED display along with protection from Cornering Gorilla Glass 3. Samsung has done great advancements in the Camera department of Samsung Galaxy s5. It features a 16MP camera which can click pictures at a resolution of 5312 x 2988. The camera module comes with an LED flash. It even features a BSI sensor which helps in taking better pictures during low lighting conditions. The main feature of Samsung Galaxy S5 camera is its Selective Focus feature. The 16MP camera module can also shoot Ultra High Definition Videos with a resolution of 3840 X 2160 pixels. The front camera on Samsung Galaxy S5 has a sensor of 2.1MP. The front camera can even record videos at Full HD with 30 fps. The Samsung Galaxy S5 is IP67 certified. This means it is dust and water resistant. This phone features a couple of biometric sensors. Just like the iPhone 5S, Samsung Galaxy S5 features fingerprint scanner just beneath the home button. It even features a fitness tracker; which Samsung calls as S Health. This tracker keeps a count on the distance you walked, calories lost, speed, duration and more. Last but not the least; the S5 features Android Kitkat version 4.4.2. You can check a comprehensive list of Samsung Galaxy S5 features by clicking here. Below is hands-on and review of Samsung Galaxy S5 from PhoneDog. Do let me your view about Samsung Galaxy S5 and the price at which it is launched in India. And please do show us some love by sharing this post on popular social networking sites like Facebook, Twitter and Google+. I love to hear from my users. Its good new to Indians. At least they can now leverage on the feature of the Samsung Galaxy 5 for their personal and business lives. This smartphone is flagship update from Samsung and its well worth this review. In kingged.com – the content syndication website for Internet marketers, this article was found where I have also share the above comment. Yeah! I really agree with that Samir. And I am very much glad you felt the article is awesome. I’m really glad Sunday you took notice and left a comment on my blog. And I am very much glad you loved the article. And yes the Samsung Galaxy S5 is going to change a lot of lives here in India. Have a great day mate. This is one such piece of technology that I’d like to lay my hands on! I’m sure a device like this will make life more productive- entertainment wise and work wise. Such are the powerful features of this device. Will definitely Kingg this post on Kingged, where I found the link to it. 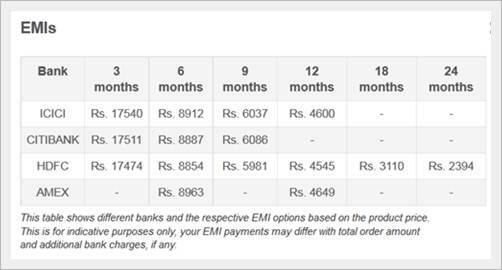 the EMI option surely be a help to the Indian customers. I just found this informative post at kingged.com – the content syndication website for Internet marketers, and I posted the above comment there: thanks for this great info. That’s a great news but can someone tell me how much does that transcends in dollars? I think it will be huge! Am I right or wrong? Samsung has brought in a massive change in this blogosphere and with the latest release of S5, the world of Technology has never being the same. I found this on kingged.com and I kingged it! When it comes to quality and features, Samsung is best. No one can beat Samsung for its service and mobile’s quality. I have bought Samsung Note2 last month, but after seeing the features of S5, I am thinking that I should have wait for one more month to get this awesome mobile. Although, its quite costly, but features wise its completely worth it. If anybody want to enjoy real gaming, this phone is for them. Through EMI (Around 2000 PM), almost everyone can afford to have this gadget. To be true SK. This technology guilt is going to stay with everyone of us all the time. I remember when I bought my MMX A110. And after one month MMX 116 was launched with Quad-Core CPU, 1GB RAM and HD Screen for $220. And I felt so bad about buying A110. And after so many phones have launched. I’d only suggest you to go on with your Note 2. You really won’t notice much difference at all. Except the S5 has completely revamped OS. And congrats for buying a Note 2.